The Schumin Web » My sister is at the big Obama event in Chicago! 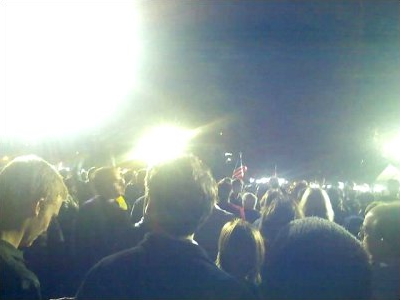 My sister is at the big Obama event in Chicago! How cool is that! 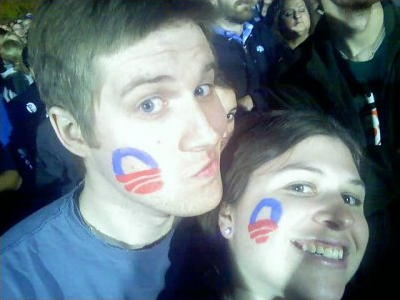 I’m sure they’re having a blast, and the two of them look really cute with their Obama face-paint. And it’s looking good for the Obama campaign, as NBC is projecting 207-135 in Obama’s favor as of this writing. Barack Obama’s got Ohio, and the old saying goes that no Republican has ever won without carrying Ohio. Web site: It's also looking good for the pro-choice crowd, as South Dakota has defeated its abortion ban, and Colorado's ballot measure on the definition of the beginning of life. Song: I think it's appropriate to say, "I Got a Crush...On Obama"